Eurolive B205D ultra compact PA & personal monitor The ultra-compact B205D packs 150 Watt..
Eurolive B207mp3 Ultra compact PA & Personal Monitor We took the things people already lo..
EV Powered Sub 12" 700w. 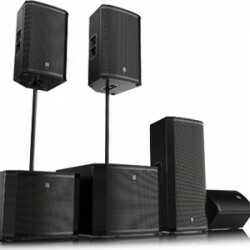 EV Powered Sub 12" 700w 15mm Plywood Enclosure, Internally Braced, with Textured Paint ..
ZLX12P: Take Control With ZLX, Electro-Voice set out with a singular goal: to deliver best-in..
ZLX15P: Take Control With ZLX, Electro-Voice set out with a singular goal: to deliver best-in..
Audiohub AH150 5-channel amplifier The AH150’s 5 Channels means that this unit is ideal.. The Audiohub AH40 compact amplifier ULTRA PORTABLE The AH40 is an ultra portable unit fe..
iNSPIRE iP500 600 Watt Powered Column Loudspeaker with a 8" Subwoofer, 6 Neodymium Dr..
EVL-12 NEO 12" passive speaker The new EVP-12 NEO is a passive two-way loudspeaker in a li..